The layout was donated to our group more or less complete, but in need of a lot of T.L.C. All the buildings have been worked upon and re-painted, the baseboards made to fit properly and all of the scenery restored as it had yellowed with age. 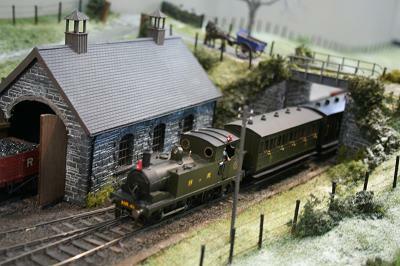 The actual Ashburton station is quite well known and we are aware that some of the model's features are not quite right, in particular the real layout is slightly curved but we feel that it captures the real one well enough. We all hold current "modeller" licences' anyway, so judge for yourself! 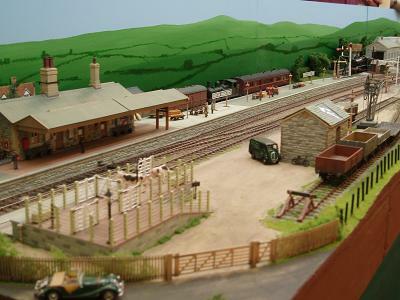 My layout is set in the late 1950's and features the fictional terminus of the line to Burton Bradstock which assumes that the Abbotsbury Branch had been extended as proposed towards (but never reaching) Bridport. It is my first EM solo effort and uses rolling stock from the BR(W) era. Locomotives are kits or re-chassied plastic models and other rolling stock is kit built or re-wheeled propriety models. To give a flavour of the Abbotsbury Branch, I have tried to model several structures on the branch-line that did exist such as the goods shed at Portesham along with Abbotsbury Locoshed and Water Tower. 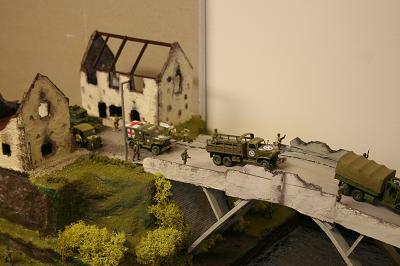 They are scratch-built mairily from styrene sheet and Wills moulded stone sheet. 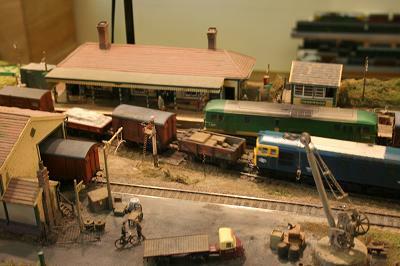 The station building and some of the huts are made from Ratio or Wills kits. Trackwork is hand built using plywood sleepers and C&L track components with turnouts operated electrically by slow-action motors with the controller of the EMGS type. The Abbotsbury Railway in Dorset was first proposed during the 1870's and finally came into existence during the 1880's with hopes of making profits by extracting iron ore from a site near to Portesham and also limestone near to Abbotsbury itself, along with local produce and livestock such as cattle and sheep. One of several schemes also anticipated extending the line further westwards, eventually as far as Bridport and beyond to Axminster and thence to Exeter. The hope was that boat traffic via the port of Weymouth would enable travellers from the continent to access the south-west of England. Although this scheme never became more than an ambition, my model layout assumes the branch line was continued westwards reaching Burton Bradstock, not too far from Bridport, before finances ran out and the line terminated there. 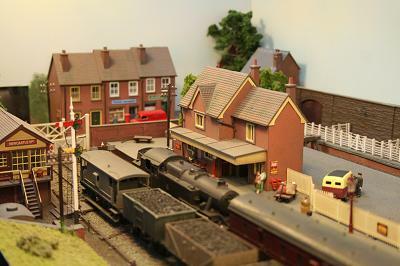 Claydon depicts a fictional Cotswold village served by a branch from the Oxford to Worcester main line. The layout started life as an oval test track, but developed into an exercise in minimum space modelling by accident following a chance remark by my partner about it fitting on her desk. It is set in winter because the original idea was for a Christmas scene complete with snow. After Christmas the "snow" was removed in order to operate the layout for my own enjoyment. It was never built with exhibiting in mind (it would weigh a lot less if it had), but some of my colleagues at Syston M R S saw it and asked if I would bring it to our next show, and I was bitten by the bug. Track is Peco fine scale, code 55. Buildings are mainly S D Mouldings with some Ratio and Kestrel kits. 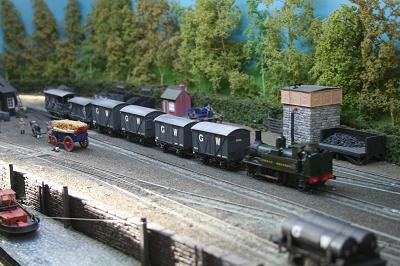 Loco's and rolling stock are the usual mixture of Farish, Dapol, Peco and N Gauge Society kits. In most cases RTR stock has been repainted and/or weathered. To the left is the main brewhouse. Centre stage is boiler house and cooperage. 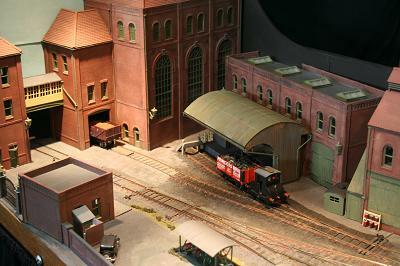 A warehouse occupies the area behind the loco shed. In the foreground, the entrance is flanked by the main brewery offices and the gatehouse. 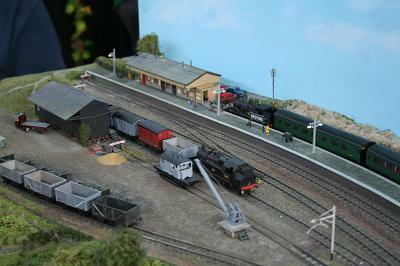 Locomotives, are in the main, from brass kits by High Level and Agenoria. Most have reduction gearing of 97: 1 + for enhanced slow running. When the Railway reached the small village of Westerham in July 1881 it was assumed by the local populace that it was only a matter of time before the line was continued on to Oxted, a mere 4 miles away. As it turned out this never happened due to the enormous cost of the extensive engineering works. 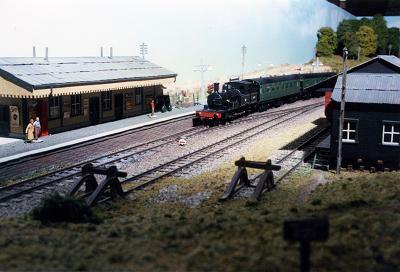 However, for the purposes of this layout, I have assumed that the extension to Oxted was built by the South Eastern Railway to provide them with a secondary route to the South East ports. 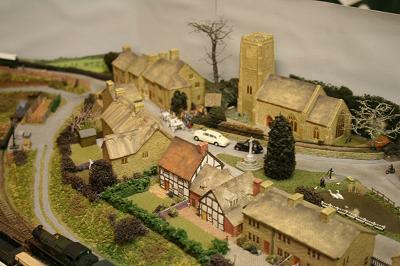 The Model depicts the small country station of Hookwood, about 1 mile north east of Oxted, as it might have looked in the BR Southern region era of the early to mid 1960's. 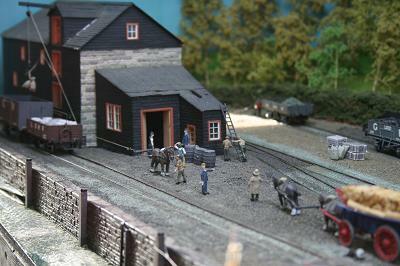 The Station building and goods shed models are based on the originals at Westerham station. The locomotives are mostly modified RTR, using Ultrascale EM wheels and Al detailing kits. 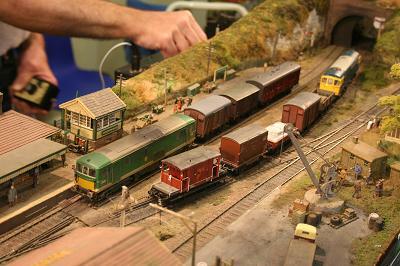 The 2 Bil EMU is an Ian Kirk kit with Branch Lines motor/gearbox and extra detailing. 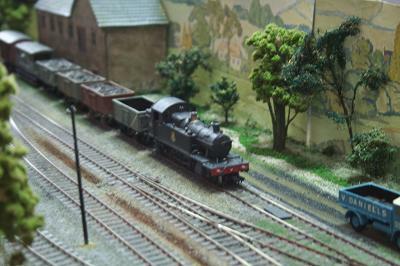 Wagons are mostly kit built with appropriate detailing and re-wheeling using EM Society wheels; Spratt & Winkle couplings are used with strategically placed electromagnets on the layout. 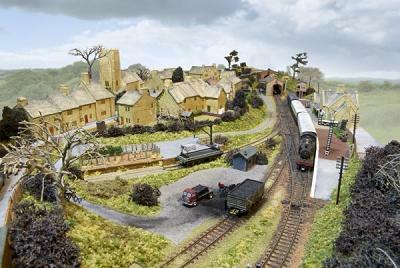 The layout features working signals and many scenic details, can you spot the lazy workman snoozing in the sunshine? Newcastle Market is based on a line that was planned but never actually completed. In 1910 the North Staffordshire Railway constructed a line from Trentham, on the main line south of Stoke-on Trent, to Trentham Park, to carry excursion traffic to nearby Trentham Gardens. The original intention had been to continue the line northwards to join up with the NSR Pool Dam freight only branch in Newcastle-under Lyme, thereby providing a link which would allow coal trains from the Silverdale coalfield to bypass the busy bottleneck at Stoke. Although a substantial steel bridge was built across the main A34 road west of Trentham Park station, the intervention of war in 1914 resulted in any further extension being cancelled. The branchline to Trentham Park was still used for excursions until the 1950s. This is where fiction takes over. It is assumed that construction of the branchline was commenced earlier, in the 1890s, and that the extension to join up with the Pool Dam branch in Newcastle was completed. A passenger terminus was constructed at Newcastle on open ground next to the large livestock market, hence the name for the new station. North of the station the branch remains freight only, with coal traffic for the Silverdale coalfield and, since I remember seeing oil tanks on the Pool Dam branch, it is assumed that there is also is a small oil depot. The station baseboards are hinged and fold up into a box-shaped structure, making the layout easily portable (it was designed to fit into the back of an MGB GT - sadly long gone). 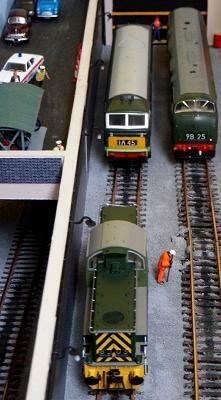 Trackwork is by Scaleway, the points being constructed on copperclad sleepers, with fiddleyards at either end utilising train cassettes. With the layout set in the late 1950s, passenger trains consist of DMUs working via the mainline to Manchester and steam hauled passenger trains, also bound for Manchester but via the Potteries Loop Line. There is also a morning and evening workers train for staff at Crewe Works (this did actually run from Stoke after the closure of Stoke Locomotive Works in 1926). Freight trains are mainly loaded coal trains heading south, with the empties heading north. There are also a couple of oil train workings each day and a pick-up freight, often conveying cattle wagons for the market. An agricultural warehouse provides another source of traffic and adds a little interest to shunting movements. Locomotives and rolling stock consist of the usual mix of scratchbuilt, kit-built and detailed/modified proprietary models, tending more towards the latter as standards have improved. The buildings are all scratchbuilt, with the exception of the signal box which is a modified Ratio kit (after the discovery that NSR signal boxes were nearly all on brick bases) and a couple of lineside huts. Newham started life as the terminus for the West Cornwall railway at Truro in April 1855 and continued to be so until May 1859, when most trains were diverted into the new station of the Cornwall! G. W. R. railway leaving Newham as a goods depot with the occasional passenger train. The West Cornwall Railway came about by the Hale and Penzance railway and its constituencies wishing to build a line to Truro and its quays to tap into the china clay and farm produce market .1. K. Brunei was engaged as the engineer for the line which surprisingly for him was built to the standard gauge. The station at Newham was a Brunei style overall roof with a hip-roofed station building, single platform and goods shed plus other buildings already on the quay at the time. 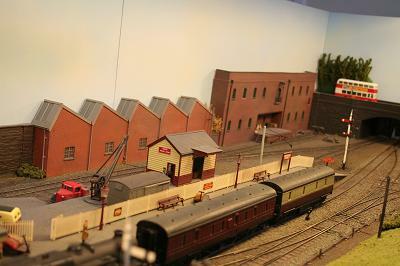 The goods depot lasted well into the 20th century also avoiding the Beeching era and finally closing in 1976. The layout was built for the 18.83 challenge and took 2% years to build. All track and points are hand laid ply and rivet, 95% of the buildings are scratch built plus a few small kits. All the ship models are kits from Langley. The base boards are constructed on the Barry Norman style of 4mm ply box beams for ends and sides and 6.5 mm ply for the top. Points are worked using piano wire and bell cranks. Portskerra is the terminus of a ficticious Highland Railway branch line on the north coast of Scotland. Although a branch to Portskerra was proposed as a Light Railway in 1898, and some surveying work carried out, the line never progressed beyond that. 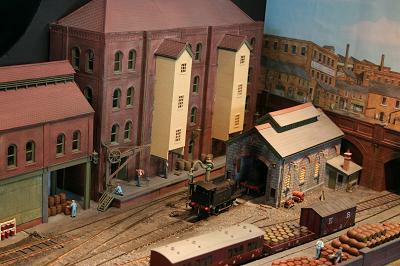 The model uses buildings of typical Highland style and the track layout has features of other Highland termini incorporated. The time period is spring 1915, the increase in traffic due to the Great War bringing many wagons from 'foreign' companies to this normally quiet line. The layout is constructed to 4mm scale, but uses E.M. gauge track for greater accuracy, plain track being C&L with hand built pointwork. Buildings are constructed from plasticard or wood. Grassland uses Noch electrostatic fibres to give a rougher look, while the leafless trees are made from twisted wire covered with filler. 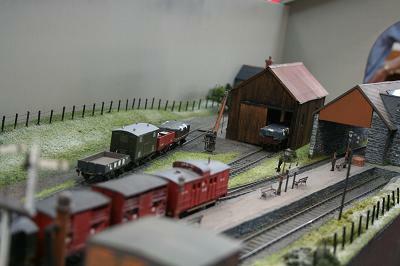 Locomotives are kit built from a variety of sources, rolling stock is kit built, modified or scratchbuilt from drawings available from the Highland Railway Society. Had the Midland Railway's line into Thornbury been extended to the river it would more than likely have been a light railway and it would have possibly gone to a timber yard with a small station close by. Assuming that it would not have been a very rich business it might have only been able to afford a couple of second hand locomotives and coaches which would have run a rather infrequent service as the line's main income derived from freight. This therefore is the basis upon which Severn Mill is based. The baseboards are of standard construction with the hand made track laid on cork. Points are operated by salvage H&M point motors and the electric's utilise the standard cab system. 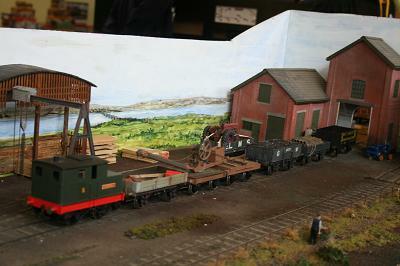 The three locomotives are kit built, as is most of the rolling stock. The majority of the buildings are scratch built. The use of three link . couplings give a prototypical feel when operating. The restricted head shunt behind the station building makes life rather difficult for the shunter but can give hours of amusement to some of the operators! The coal merchant, however, gets a bit peeved every time his wagons have to be shunted out of the way to allow a delivery to the wood merchant or the factory. A Bank Holiday Southern 60's Steam Experience. 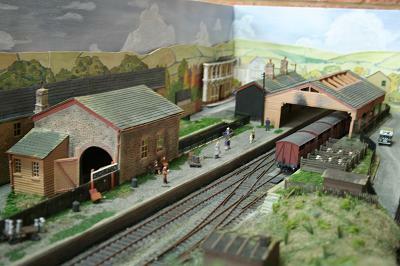 Uplyme is a 3mm scale model based on the former Southern Railway seaside terminus at Lyme Regis in Dorset during the 1950's and 1960's. The real Lyme Regis station was actually much closer to the village of Uplyme then the town it was named after. Because of the tortuous curves along the branch line it was operated by only two classes of locomotive successfully, the Adam Radial Tanks and the Ivatt class 2 2-6-2Ts. Both classes can be seen on Uplyme today. 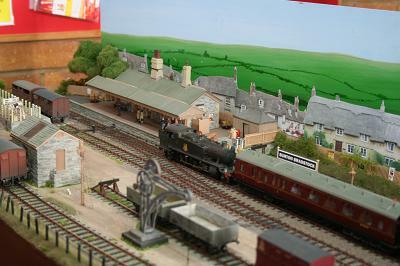 Uplyme suffers no such restrictions and features a wide selection of Southern Steam engines. These include a rebuilt West Country, M7 tanks, Southern 2-6-0s and BR Standards. 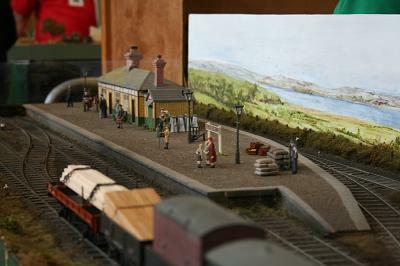 The buildings are accurate models ofthose at Lyme Regis during LSWR days but the period is set well into the BR era. Most of the locomotives and rolling stock in service today are built from kits produced by the 3mm Society. If you would like to know more about the Lyme Regis Branch, the 3mm Society, modelling or collecting in 3mm (TT) scale please ask one of the operators.